Minnesota Gov. Tim Pawlenty wants to double the amount of ethanol required in gasoline sold in the state. The governor also expects state government to cut gasoline consumption in half in the next decade. Those proposals are part of a renewable fuels initiative announced by the governor on Monday. Moorhead, Minn — Minnesota is the only state to mandate ethanol-blended gasoline. 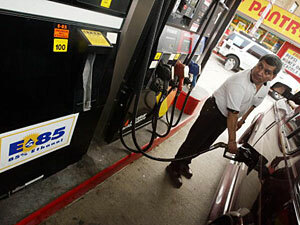 State law requires gasoline sold in Minnesota contain 10-percent ethanol. Gov. Pawlenty will ask the legislature to change state law to require a 20-percent ethanol blend. The governor says increased use of renewable fuels is a common sense policy choice. "This type of approach is not only good energy policy, it's good agriculture policy and good economic development policy for rural Minnesota and it's good policy with respect to our economy more broadly," he said. Experts say the biggest barrier the proposal faces will be from auto manufacturers. They have been slow to embrace ethanol fuels, and it may take some time for them to approve a 20-percent ethanol blend in new cars. First the plan must be approved by the Legislature, the 20-percent ethanol mandate would not take effect until at least half of new cars offer warranties for using the blend. The plan could also face opposition from refiners and gasoline marketers who would have to adapt their fuel distribution system. Brian Jennings, executive vice president for the American Coalition for Ethanol, applauds Gov. Pawlentys plan to increase ethanol use, but says making it happen won't be easy. "It is very aggressive and there are practical challenges associated with not only the warranties but getting the petroleum marketers to agree to move forward on something like this. I think it can be done, but it will require some time and a lot of debate before anything is ever implemented," according to Jennings. Ethanol is made from corn and other crops. There are now 14 ethanol plants operating in Minnesota. State Agriculture Commissioner Gene Hugoson says more plants are under construction. Hugoson says this proposal would provide a significant new market for farmers. But the governor says he doesn't have any numbers to attach to his proposal yet. It's unclear how much more of the states corn crop would be turned into ethanol. Gov. Pawlenty also announced he's signed an executive order requiring the state fleet of vehicles to cut gasoline consumption by 50 percent over the next decade. To do that the state will use more ethanol fuels, buy more fuel efficient vehicles and reduce travel by state employees. Another proposal Gov. Pawlenty will bring to the Legislature involves high-occupancy-vehicle lanes in the Twin Cities. The governor wants to open HOV lanes to hybrid fuel cars even if there's only one person in the car. The governor is also directing the Metropolitan Council to buy at least 20 hybrid fuel buses in the next four years, and promoting an initiative to make the University of Minnesota a National Center for Biofuels Research. Gov. Pawlenty says he hopes other states will follow Minnesota's lead on increasing the use of renewable fuels. "That's going to be a good thing for America. You see the situation now with $50-a-barrel oil, or nearly so, and one significant hiccup in the Middle East roils the foreign oil market and has an immediate and significant impact on the United States of America. We need to transition away from that type of addiction as quickly as possible," Pawlenty said. Gov. Pawlenty says his initiative is a first step toward making Minnesota and America more self sufficient.